When should you use a PUR cable versus a PVC cable? Does the cable need to be halogen-free? No matter what application you are working with–from robotics to metal cutting to packaging–the answers to these questions are significant, because an entire system is only as good as the weakest component. It is therefore crucial to understand and select quality accessories, such as cables, to ensure the overall quality of the system. Bend radius refers to the smallest curve that a cable may have when laid without changing the characteristics of the cable. 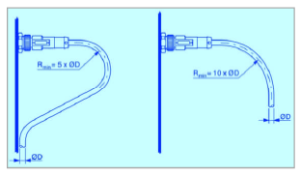 Bend radii (Rmin) are specified in relation to the cable diameter. Cables and wires are defined as halogen-free if they are made of materials that do not contain saltforming chlorine, fluorine, bromine and iodine. The insulation and cladding of these cables are made of polymers based on pure hydrocarbons. When these materials burn, only water vapor and carbon dioxide are emitted (no corrosive or toxic gases). The use of halogen-free cables becomes more and more compulsory with increasing numbers of buildings where safety consciousness to protect humans and valuable materials take a special significance, including hospitals, airports, hotels, theaters, schools, multistory buildings, and more. When should I use PUR cables? Various industries, e.g., machinery- , plant- or tool-making industries, are working particularly with mineral oils, alkalis and aggressive coolant emulsions and under difficult environmental working conditions. Due to these conditions, the electrical cables have to perform to exceptionally high standards. When flexibility, abrasion and oil resistance have to be guaranteed, use PUR cables! What’s the difference between PUR and PVC cables? A PUR cable is a flexible, silicone- and halogen-free cable with PUR outer sheath polypropylene conductor insulation. It is oil and flame resistant and can be used in dragchain applications with minimal bend radius. PUR cables are very well suited for flexible applications in robotics, machine tools and metal cutting manufacturing. Pure PVC cables are suitable for medium mechanical stress for packaging machine applications as well as assembly and production lines. PVC cables have good resistance to acids and alkalis and therefore are ideally suited for use in the food and beverage industry. PVC cables have limited abrasion behavior and limited resistance to oil and chemicals. Jill is a Product Manager covering electromagnetic sensors and connectivity.